Rick Harada has been working for the City of castle Hills since 1993. Mr. Harada worked in the Street department for 3 years and the Sanitation department for 7 years before being promoted to full time Public Works Director in 2003. Rick’s responsibilities include supervising 4 employees in the Street and Maintenance department and 6 employees in the Sanitation department. Mr. Harada and his teams carry out the daily functions of garbage and recycling collection, brush and leaf collection, street repairs, crack sealing, potholes, drainage culvert maintenance, and municipal building maintenance. Rick also contracts with outside companies to work on larger street projects for the City. In addition to holding the title of Public Works Director, Mr. Harada has also been the Animal Control officer for over 10 years. Rick earned his animal control certification in 2004, and has continually supervised the daily operations of the on-site animal shelter. Rick has been instrumental in the creation and the maintenance of the shelter, and has forged many cooperative relationships with other animal care facilities over the years. 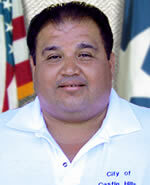 Rick Harada is a valued employee who always gives his best effort for the City of Castle Hills.